The new Price Is Right host broke the news to David Letterman. The march of comedians to the game show arena continued in a big way Monday with CBS' announcement that Drew Carey will replace Bob Barker as host of The Price Is Right. 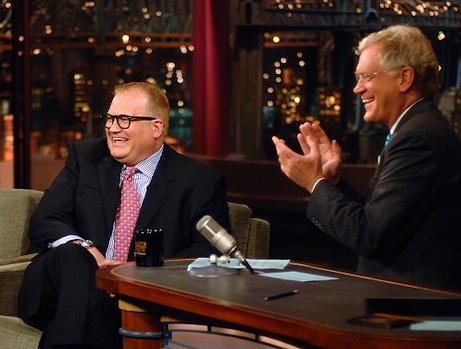 Carey announced the news on Late Show with David Letterman after talking with TV critics last week about his ongoing negotiations for the job. "One of the things we're having trouble with is I want to change the name of the show to The Magic Golden Wheel," he said. Carey also is set to host a new CBS prime-time quiz, The Power of 10, which is set to premiere on Aug 7th. That show has a possible $10 million grand prize. "I wouldn't consider doing Price Is Right work at all," Carey said. "But it would be so enjoyable to be in front of that audience with people screaming. And all I'm doing is giving away prizes. And it's not even my money." Carey joins Howie Mandel, Bob Saget, Jeff Foxworthy, Wayne Brady and Dennis Miller among other comics that lately have gone the game show route. Foxworthy, who presides over Fox's biggest new hit, Are You Smarter than a 5th Grader?, said his wife asked him whether he enjoyed doing game shows more than sitcoms. "And I said, 'Well, with a sitcom, you had to memorize 55 pages every week.' With this, it's really improv . . . kind of me being funny as it develops. So I guess that's why the trend. Anytime in this town when something works, you're going to see 20 more like it." ***CBS has sunk its ballyhooed summertime reality series Pirate Master, and will burn off its remaining five episodes on CBS.com. The show's Tuesday, post-Big Brother slot initially will be filled by 48 Hours.